Having worked as the creatives for Hastings Pier Charity, since the restoration works began almost 4 years ago, we were invited to curate and direct the official Opening Day’s morning and afternoon entertainment for the expected 10,000 visitors, May 21st 2016. 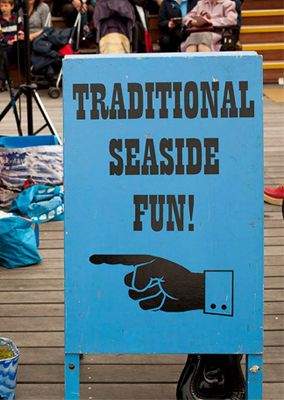 We worked around the theme of the Pier’s, world famous, musical heritage with a good measure of tongue in cheek ‘traditional seaside fun’ thrown in. More details and images to follow.